This content is in partnership with Marshalls. All the opinions expressed are our own. In January, year after year, we love to create a new family resolution. This new year our goal is to live a more mindful lifestyle by spending even more quality time together as a family. We’re always on the go and near our computer or phones, so making this resolution is a reminder to spend meaningful time together and really connect. It’s our belief that setting goals as a family will ultimately help and encourage us to improve overall. 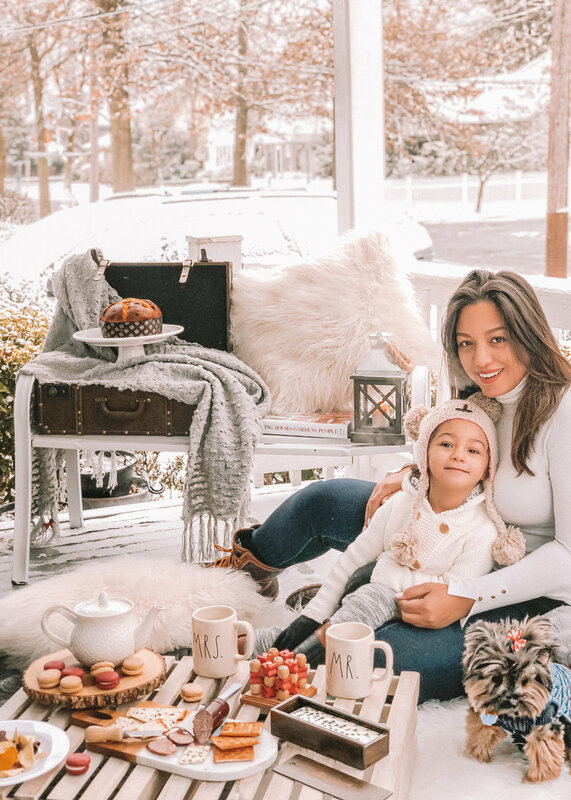 We teamed up with Marshalls to highlight this idea to all of you through a winter picnic at home; an example of how to spend quality time together this new year. One of the reasons we love picnics, and share them on our blog, is that they are all about spending time as a family. For this winter picnic, we included some fun activities that helped us unplug and enjoy the afternoon together. The thirst for something new and exciting is always something we’ve loved. The notion was one of the reasons we went to Marshalls to get some items for our family winter picnic, which conveniently was held on our front porch. We visited a few different stores and loved exploring the wide variety of high-quality products across several departments such as fashion, home, health, and beauty. I actually visit Marshalls every Sunday with my mom because they have so many new items all the time so we always leave with something we love at a great price. This constant refresh of merchandise is ideal for anyone that's looking for products to help positively update their lifestyle for a new year’s resolution. In case you want to get inspired and perhaps create your family retreat in your home, here is a list of some of the merchandise we purchased at Marshalls that we loved and you might too. 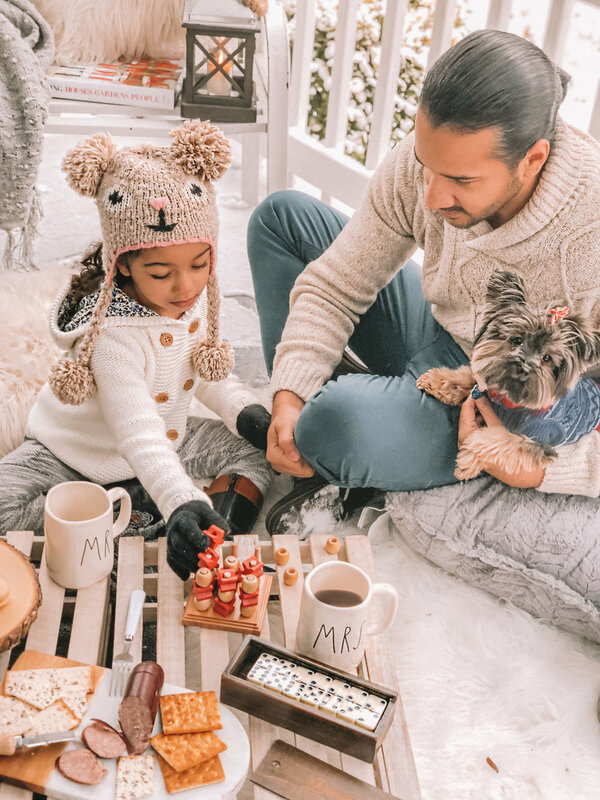 Family Time: one of the most important things in our New Year’s resolution is to spend more time together as a whole through fun family activities like playing dominos, tic tac toe with Chanell, and/or reading stories to each other. We were so excited to find these two classic, wooden game sets at Marshalls. Home: for comfort, we purchased some beautiful throw pillows and blankets which created a cozy space for gathering together as a family. Tip: Marshalls has an extensive brand name assortment with different colors and patterns at incredible prices. Also, in the home department, you can find candles, home decor, and many more like these adorable mugs from a designer we love. This January, we hope to inspire and encourage you all to start your new year living a more mindful lifestyle with your family. To focus on love, wellness and spending time together which is most important. Special thanks to Marshalls for helping us start our new year with a bang. We hope you enjoy this new addition to our picnic series. In all honesty, we can say that the overall shopping experience at Marshalls was delightful, they have so many different things to help your family achieve 2018 resolutions, like the items from our picnic. We've started this year with the idea to improve our lifestyle, and with steps such as this, we believe we're on the right path for betterment. On a final note, remember to love one another, to explore new things and create new engaging memories as a family because these will last a lifetime.